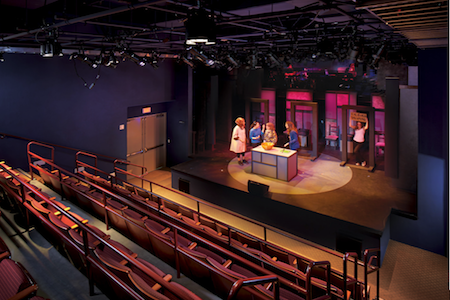 Did you know that NoHo Senior Arts Colony has our very own professional theatre as one of our special amenities?! We do! It’s home to the prestigious Road Theatre Company who produce top-rated theatrical productions. Our beautiful theatre is stadium style with 78 seats. It offers a uniquely up close and personal experience to enjoy incredible acting and writing. The Road Theater Company has been providing unique performances for over 25 years. They celebrate unique voices, diversity, and all ages with powerhouse productions. We believe it is essential for the health of the American ethos to advance the larger theatrical conversation of our national culture. Through this dialogue we animate and inspire both our artists and audiences with the realization that through art and action we are lifted into the searching of soul, the revelation of humanity, the awareness that we are not alone and the struggle to make sense of our existence on this earth – as it is and as we wish it to be.